Take out the engines and brakes and 6 racers tight enough tickle each other during a 1.8 mile, 22 turn descent. That is Maryhill Windwalk: the ultimate DOWNHILL GRAVITY SPORTS experience!!! Famed for her righteous yellow and ebony curves, this road to nowhere is the most technically unique and flawlessly engineered strip of pavement in the Americas. Maryhill Loops Road. 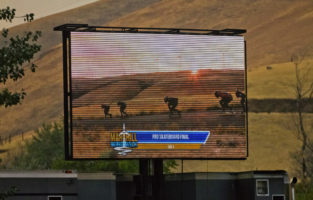 Racing Maryhill is a constant battle of stamina, skill, intuition and a dash of luck. Will Zak Maytum threepeat as the King of the Hill or will California's top competitor, Max Capps make the competition check out his latex clad behind? With veteran champions like Brazil's Douglas Dalua, past Juniors World Champions such as Max Wippermann, as well as the rest of the world's best including Billy Bones, Max D Ballesteros, Kyle Wester Skate, Daniel Engel, Brennan Bast, and Emily Pross… THINGS WILL GET GNARLY! In anticipation for Maryhill Windwalk 2018, we are proud to present the penultimate episode of 2017's #WindwalkWednesday with PROFESSIONAL DOWNHILL SKATEBOARDING.